Classic design French press consists of a narrow cylindrical glass jug, equipped with a lid and a stainless plunger, which fits tightly in the cylinder glass beaker and has a fine wire mesh acting as a filter. Coffee is brewed by placing the coffee and water together, leaving to brew for a few minutes, then depressing the plunger to trap the coffee grinds at the bottom of the glass jug. A French press requires coffee of a more coarse grind than that used for a drip brew coffee filter, such as produced by a burr mill grinder rather than the whirling blade variety, as a finer grind will seep through the press filter and into the coffee. Because the coffee grounds remain in direct contact with the brewing water and the grinds are filtered from the water via a mesh instead of a paper filter, coffee brewed with the French press captures more of the coffee's flavor and essential oils, which would become trapped in a traditional drip brew machine's paper filters. French pressed coffee is usually stronger and thicker and has more sediment than drip-brewed coffee. 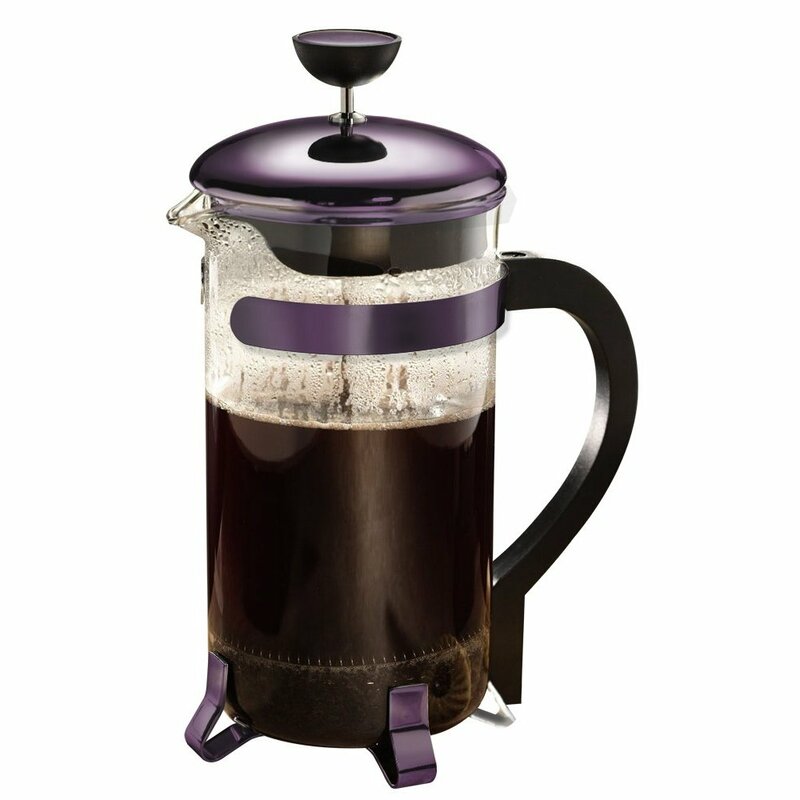 Click the button below to add the Classic 8 Cup Coffee Press metallic plum to your wish list.